I think Bir has become one of my favorite places in Himachal Pradesh now. Why? Well, there are numerous reasons for this love I feel towards this small town. Bir has the most gorgeous sunsets ever and since I am a sucker for good sunsets, it is no surprise that I am in love with this place. But that’s not all though, the beautiful landscapes, clear skies, lovely people, and quaint villages are also part of why I like Bir Billing so much. And while a lot of you might think that two days is enough to explore this wonderful town, I respectfully disagree. You can easily spend a week here and only then will you be able to even start discovering the hidden gems of Bir. Lucky for you, I have prepared this guide which includes all the details that you need to plan a trip to this amazing hill station. A small village nestled in the valleys of Kangra, Himachal Pradesh, is Bir and situated at a distance of 14 km is another hamlet, Billing. However, you would find that both these villages are often referred together because of a simple reason. They form India’s best paragliding site and Asia’s second-best paragliding site. However, even though they are so popular all over the world now, they still remain untouched pieces of mountain beauty. So, if you wish for an escape to a quieter and peaceful hill station in Himachal then Bir Billing is where you should head to. Apart from being known for paragliding, this place is also known for its Tibetan roots and is a great way to experience the Tibetan culture. 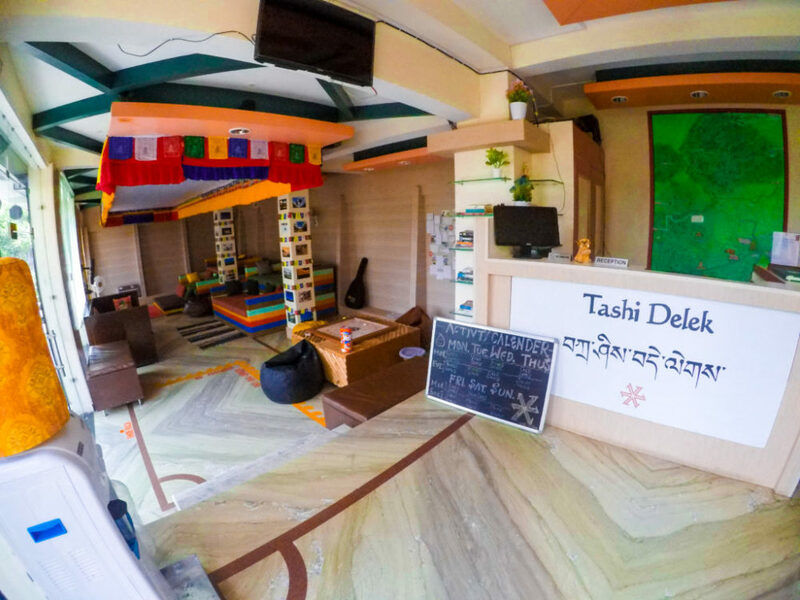 Here, you can explore the monasteries and learn more about the life of the monks while trying some delicious Tibetan cuisines like momos, Thukpas, Sha Phalay, and so on. Since Bir Billing has become such a popular paragliding spot, there are several easy ways to reach this city. Here are a few transportation modes that you can choose from while planning a trip here. From Delhi, there are a few direct Volvo Buses which will drop you at the Tibetan colony or Chougan village. Bir is just 1 km from here and can be easily reached on foot. However, you will mostly be staying in Chougan village so taking a direct bus here would be a smart option. You will get HRTC Volvo Buses which cost around 1500 INR and a few private Volvo Buses from Northern Travels, Laxmi, etc. which will cost around 900 – 1200 INR. These buses take 11 – 13 hours to reach and can be booked from the Redbus app. If you are looking for the cheapest mode of option and have some time at you hand, then this is the perfect means of transportation for you. Take a train till Pathankot Junction and then take the toy train till Baijnath station. A general ticket from Delhi to Pathankot will cost you about 175 INR and the toy train would cost you not more than 50 INR. Once you reach Baijnath, you can take a taxi till Bir for 250 INR or you can wait for a bus. There is a local bus Anurag which leaves at every half an hour and will cost you about 20-30 INR. It will leave you at the Chougan junction from where you will need to walk a km or 2. Note: Toy Train takes 6-7 hours to cover the distance from Pathankot to Baijnath. If you don’t have the patience to sit 7 hours in a toy train then you can take a bus from Pathankot instead. There are several local buses leaving for Baijnath from there which will cost about 150 INR and take 3-4 hours to reach. From Baijnath, you can take a taxi or wait for the bus, as per your convenience. A simpler and budget-friendly option would be to take a direct HRTC bus to Baijnath which will cost approximately 650 – 700 INR and then take a local bus to Chougan. In case you don’t get a local bus, you can always get on a bus going to Jogindernagar or Mandi and then get down at the Bir exit on the highway. If you are traveling in a group then you can also take a taxi from Pathankot to Bir which will cost you about 3000 – 3500 INR and will take 2-3 hours to reach. If you have your own car then you can drive it till Bir Billing, the roads are decent for driving and it will take you about 10 hours to reach. You can also get a taxi from Delhi to Bir but it will cost you a bomb so choose carefully. As is the case with most hill stations, Bir Billing is a year-round destination and can be visited any time you want. However, the best time to visit Bir Billing mainly depends on the activities that you are planning to do here. There are four season to visit Bir Billing and below is a detailed description of what you can expect in each season. If you are looking to escape the heat the Summertime, April – July is the best time to visit Bir Billing. The weather is pleasant and cool here and you can also try paragliding, camping, trekking, etc. during this time. Summer season is great for relaxing and doing adventure activities in Bir and will have something to interest everyone who visits here. If you don’t mind rainfall and would like to avoid the crowds here then monsoon is a great time to visit Bir Billing. At this time, you can also go on a short hike to the nearby waterfalls and river pools and make the most of this time. Also, the entire Billing valley looks fresh and lush green at this time which is quite therapeutic and calming. Monsoon usually starts here between 15 – 30 July and lasts till mid-September. While monsoon is a good time to see the hill station turn green, it might not be an ideal time to visit as you won’t be able to go out much. 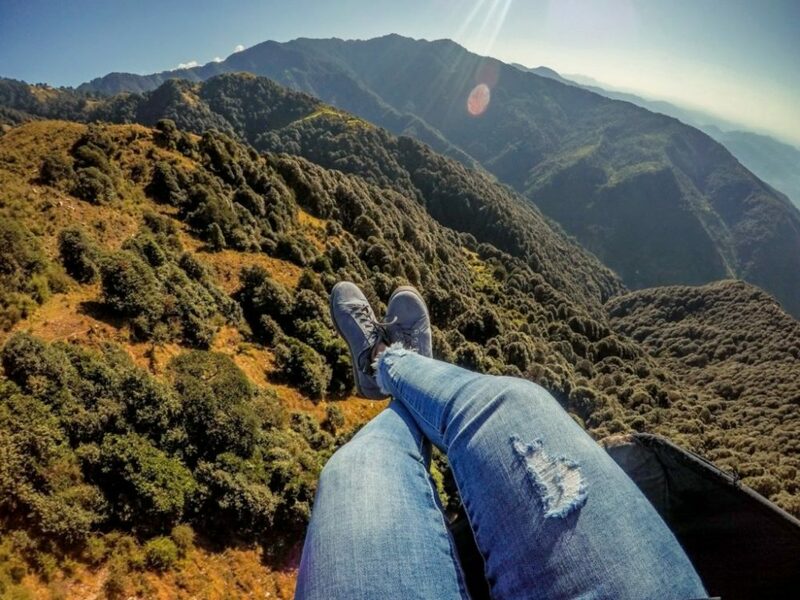 So, if you want to experience the advantages of monsoon season while being able to enjoy paragliding here then mid-September to mid-October is the best time to visit. During this period, the crowd will still be less and you would still be able to enjoy waterfalls, paragliding, and other trekking adventures. For people who don’t mind the cold and are really invested in learning or doing Paragliding, the winter months from October to February is the best time to visit. From October to December, you will have good flying conditions for long flights as well. By the end of December, it might snow at Billing so you will have to trek in the snow for 2-3 km before you reach the take-off site. But flying when the mountains are covered with snow is altogether a different experience. Now, let’s talk about something important before you plan your visit to Bir Billing. One thing to keep in mind is that you will be mostly staying in the Chougan village which is around 2 km from Bir village. And there is only one ATM here, right in the middle of the market. Yes, that is right! Also, this ATM tends to be out of cash for 5 out of 7 days so don’t come empty-handed here. Most of the shops, restaurants, and stays accept only cash so you might be in trouble if you don’t have cash with you. There are 2-3 ATMs which are around 4-5 km from the Tibetan Colony, on the Bir Manali highway. So, withdraw sufficient cash before heading to this place. As for the Network availability, you get good reception for Airtel, Vodafone, BSNL, and Jio in Bir and Billing, But, if you are planning for Rajgundha then everyone except for Airtel and BSNL users will receive no signal at all. Bir and Billing are both small villages but still, there is a lot to see here which can easily take 3 to 5 days of your time. Here is a list of places that you should consider when planning a visit to this magical village. Personally, one of my favorite spots in Bir is the Landing site which is also popularly known as the Sunset point. Situated at a distance of 600-700 m from the Tibetan Colony market, this place is a picnic spot where both tourists and locals gather in the evening to watch a mesmerizing sunset. Since this is the paragliding landing site, you will witness many paragliders here throughout the day. There are also a few cafes and restaurants here where you can eat and enjoy the mountain view while watching the sunset. And the best thing is that it is completely free of cost. One of the largest monasteries in Bir, Palpung Sherabling Monastery is located about 3 km from the Tibetan Colony Market. Located in a small village called Bhattu, this monastery is also known as the Bhattu monastery and offers the most amazing backdrop in the form of Dhauladhar ranges here. This place was started and built by Kenting Tai Situpa who used modern materials to build Tibetan traditional architecture. As this place remains isolated from the nearby town, it is quite peaceful and quiet here and one can learn more about the Palpung tradition here. You can either take a mountain bike here (Cost: 400 – 600 INR per hour) or you can hire a cab which will cover both Dharmalaya Institute and Paplung Sherabling Monastery in 1500 – 1800 INR for 4 people. Another popular destination often clubbed together with the Bhatti Monastery is the Dharmalaya Institute which is situated around 4 km from the Tibetan Colony. This institute focuses on sustainable living and holds several training sessions, workshops, retreats, etc. to share knowledge about green building, organic farming, sustainable village development, and so on. Here, you will come across volunteers who live here to learn about sustainable living and help them develop more ideas and implementations. You will also see how they use mud architecture to build safe and sustainable homes to stay in and how they keep developing new ideas for the same. This offbeat spot which many tourists often miss in Bir is one of the hidden gems of Bir. Gunehar is a small village located at a distance of 1.5 km from Bir and often comes on the way to waterfall and other day treks from Bir. Nestled amidst the mountains, flowing beside Gunehar village is the Gunehar river which is the major water source for this village. You can hike to this village and then spend some time in the Gunehar river pool for a unique and refreshing experience. And the mountains surrounding you will definitely give a magical feel to your adventure and will make an amazing backdrop for photographs. Another popular tourist spot in Bir is the Chokling Monastery which is one of the most popular monasteries in Bir and is located in the middle of the Tibetan Colony. This place is also the home to a huge Stupa and also houses a magnificent statue of the Padmasambhava. You can come here to meditate in the monastery or talk to the monks here to learn more about their life. The best time to come here is usually in the evening because it is quieter at this time and you can also see the sunset light reflecting on the stupas here. A smaller monastery in comparison to Chokling or Palpung Sherabling Monastery, Nyingyang is right in the middle of the Tibetan colony road. 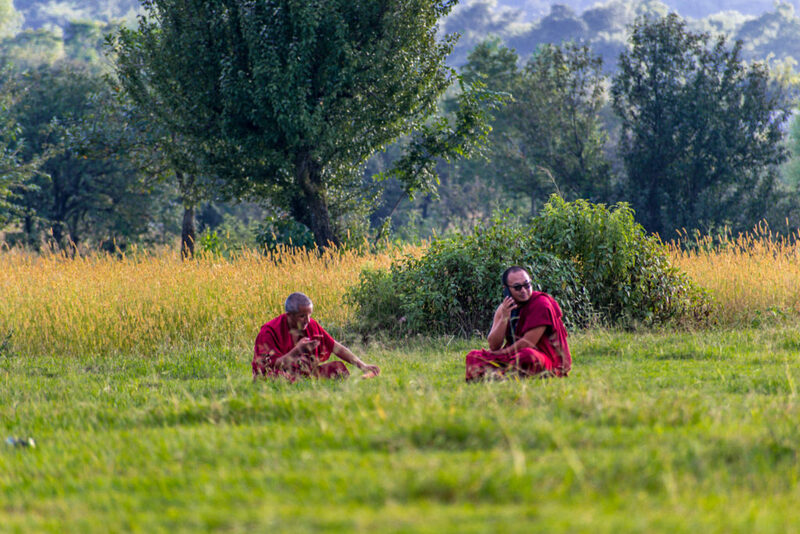 It is quite peaceful here as the monks are busy going about their work and training. You will also find several young monks here who are studying and undergoing their training here. And on a clear day, you might be lucky enough to see a few gliders just flying above this monastery which is quite colorful and amazing to watch. Bir had many small waterfalls nearby which one can reach by hiking or trekking a little. One such waterfall is the Bangoru waterfall which is located at a distance of 4.5 km from the Tibetan Colony. The path to this waterfall is quite simple and easy so you won’t need to take any guide for it. Just head towards the Gunehar Village or Billing junction in Bir and then walk straight. You can keep your GPS on to keep a track of the location or you can ask the locals for the direction. Another popular monastery that people often explore in Bir is the Tsering Jong Monastery which is located before the Tibetan Colony and is a 15-minute walk from the market. This monastery has a beautiful design and architecture and has a huge enclosure inside which there is a park and a residential area as well. The entire area is beautifully decorated with trees and flowers and there is also a cafe inside this monastery enclosure where you can eat or chill for some time. 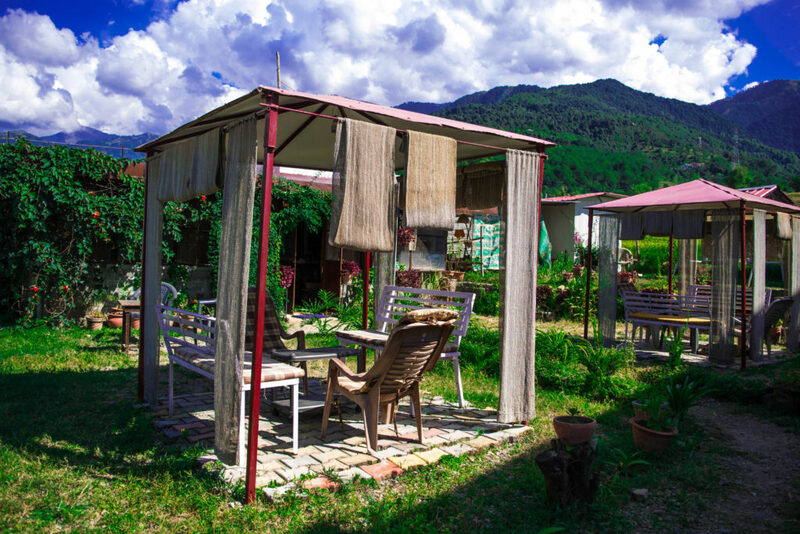 On the opposite side of this monastery, you will find an empty field with Prayer flags strewn all around it which gives it a really colorful and charming feel. How funny it is that the one who should be adept at saying goodbyes by now actually runs away from them. One of my favorite places near Bir Billing is the Rajgundha Valley from where you can clearly see the Dhauladhar Ranges and the Barot Valley. Lying between Barot and Billing, Rajgundha is a small village which is still not commercialized so you won’t find many camps or homestays here. One has to take their own tents to camp here but you have to be careful because jackals often roam at night here. You can also interact with the villagers who stay here in the summer and part of the winter season. This is because once it snows, their small wooden houses are not able to protect them from cold anymore so they trek back to Bir and stay for the winters there. You might also come across some animals like bear, jackals, leopards, etc. while trekking to this mountain village. Deer Park Institute is another popular place in Bir which will barely take 30 minutes to explore the place. In this institute, they teach the traditions of Buddhism along with Indian philosophy, science, and arts. There are several workshops held here too which anyone can enroll in and there is a monastery here where you can spend hours meditating. This is yet another great spot for watching a sunset where you will feel a lot of positivity and peace. And you can head towards Bir village by making your way to the backside of this monastery. Another great place to check out and camp at is the Billing Take Off Site. From here, you see the view of the entire Bir village and a few nearby villages too. Also, this is the starting point of your Rajgundha trek as well and there are several camps set here for people who are interested in camping for the night here. As this is the take-off site, you will see so many people here getting ready for their first tandem flight. To be honest, it is quite exciting to watch people run and take off from the edge of the peak just to fly like a bird. Known for its Hydel project, Barot Valley is located at a distance of 53 km from Bir village and is another great day trip to explore. If you are interested in trekking to Barot then it is a 20-22km trek from Billing where 3/4th of the route is easy. It would take you around 5-6 hours to reach from Billing to Barot and there are many camping and stay options to explore here if you wish to spend the night. In Barot, you can go to the Winch Camp or do trout fishing at the Uhl river. You also have a few artificial lakes here to explore, a wildlife sanctuary, and a few temples to keep you occupied here. Another popular excursion from Bir, at a distance of 13 km, is the Baijnath Temple which is a Nagara style Hindu temple, constructed in 1204 A.D. This temple is dedicated to Lord Shiva and has a Shiva Lingam secured inside the temple. There are many inscriptions and wall carvings both inside and outside of the temple which is quite fascinating to watch. The inscriptions are written using Sharada script and local Pahadi, Takri script and offers details about the construction of this temple. You can take a local bus from Bir to reach the Baijnath Mandir and then spend some time here. Last, but not the least, you can also take a day trip to Palampur which is situated 30 km away from Bir. Palampur is a small hill station which is famous for its tea estates and has a few scenic spots to entrance you with its mountain views. 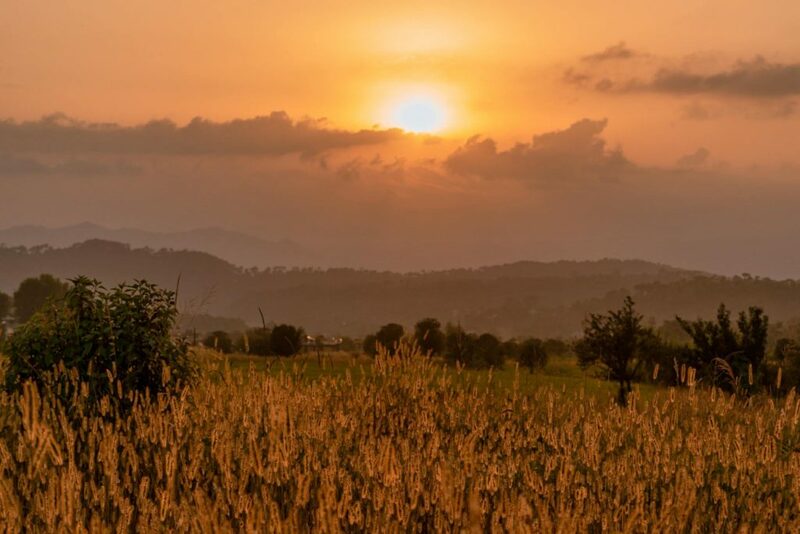 You can also see the magnificent Dhauladhar Ranges from here and can spend a couple of days here if you are looking for a peaceful and secluded location. Here are a few top things that you should experience when exploring this area. As mentioned earlier, Bir Billing is India’s best paragliding site so it would be quite foolish to not try tandem paragliding here. In tandem paragliding, you glide along with an instructor and can simply enjoy the view while the paragliding instructor takes care of the technical aspect. You can go for an early morning glide or an evening glide to catch the sunset and can admire the amazing mountain views from a height. Trust me, this is one of the most exciting experience ever and no, you won’t feel scared at all! One of the things that I enjoyed a lot during my 1-month stay in Bir was watching the gorgeous sunsets at the landing site here. I would head towards this place every evening and then wait for the sun to set down and would be pleasantly surprised every time. Because you see, sunsets in Bir are really gorgeous and unique each day. 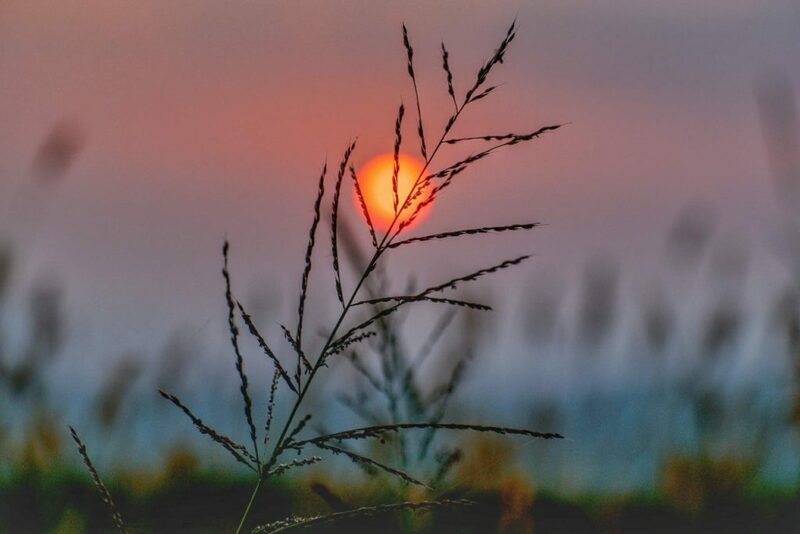 No two sunsets here would turn out the same so you will always be wondering the type of sunset that you will be seeing on a particular day. So, if you love sunsets like me, then watching a sunset at the landing site is the best way to end your day in Bir. Another thing that you must do while in Bir is to try the local Tibetan cuisine here. You will find many shops serving chicken momos, mutton momos, veg momos, Thukpas, noodles, Sha Phaley, and so on. A Thupka is a Tibetan noodle soup and is quite popular in Sikkim, Himachal Pradesh, and Ladakh region. It is spicy and delicious and is available in both vegetarian and non-vegetarian variant. Sha Phaley is another local Tibetan dish which is basically bread stuffed with cabbage and beef (non-vegetarian variant) which is made into a semi-circular shape and is deep-fried in a pan. There is another popular activity in Bir Billing is to take a monastic tour on a mountain bike. You can go with a tour or just hire a mountain bike yourself and cover the 5 main monasteries and institutes here: Paplung Sherabling Monastery, Chokling Monastery, Tsering Jo Monastery, Nyingyang Monastery, and Dharmalaya Institute. This is a great way to cover all the monasteries here and you get some really amazing views on the way to Paplung Sherabling Monastery and Dharmalaya Institute. So, do give it a try when you are here. Apart from monasteries, you also have a couple of waterfalls, hot water springs, and river pools here where you can hike and enjoy the landscape. Most of these hikes will take about 3-4 hours so make sure you carry some food and drinks to keep yourself energized. Also, avoid trekking to these places during the monsoon alone as you might get hurt or might come across some leeches. If possible, then take a local with you on these treks and go in groups of a minimum 2-3 people. If you have researched a little about Bir Billing then you would have come across the Rajgundha Valley and the 360 Degree Trek. The trek is organized by Zostel Bir and is a 2-3 days affair where you make your way to Rajgundha, stay for a night and then head to the summit. Then, you camp here for the night and next day, leave for the return journey which happens via the Barot valley route. Overall, this is a great chance to spot some planets, stars, and watch the Milky Way Galaxy. And if you are interested, then you can also indulge in a little astrophotography here. I know that Bir Billing is often not known for its food but it is a pity because there are some really amazing cafes and restaurants here. Apart from the Tibetan cuisine, you will also find India, Continental, Italian, Chinese, and numerous other cuisines here. So, do give your taste bud a chance to expand and try a new cafe/restaurant for every meal here. Trust me, you won’t be disappointed by a lot of places here. Finally, one of the things that I really liked to do in Bir was to go to the landing site in the morning, around 10 a.m. and see the paragliders in the sky. You could clearly see the distant mountain peaks covered in snow while enjoying some peace and quiet. Landing site looks really exquisite in the morning as there is no one around so you can just sit here and relax. 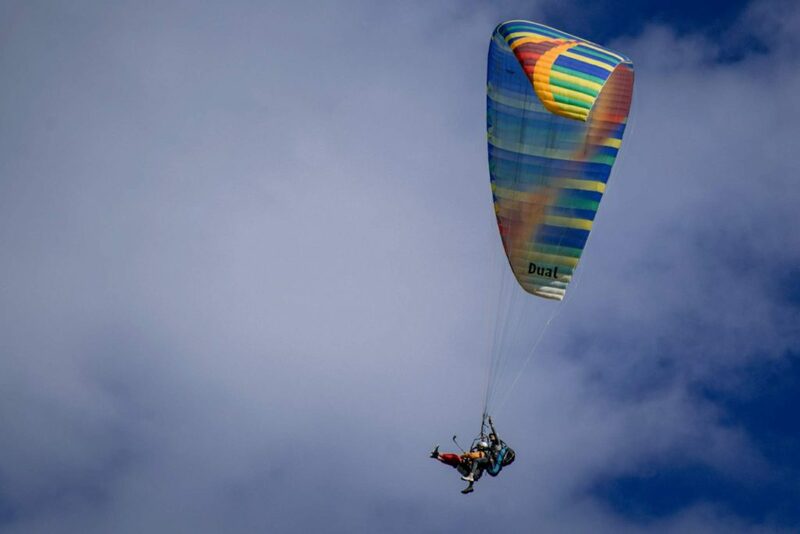 And you can also get some close-up shots of the paragliders in the air which is perfect for photography enthusiasts. In terms of stay, there are a few hotels and guest houses in Bir Billing but not many hostels. So, finding cheap accommodation here can be a little tricky. If you want the cheapest option then there is the 6-bed mixed dorm for 399 INR or the 4-bed mixed dorm for 449 INR. You can also take a standard room for approximately 1200 INR. But make sure that you book in advance because, in the peak season, Zostel Bir tends to remain sold out. Also, if you are planning for a busy weekend then you might see a surge in the prices. So, plan your trip carefully and book your stay in advance. Another option in the hostel department is to book a place at GoStops hostel. It is slightly costlier than Zostel but it also provides free breakfast in its package. The cost of a 6-bed female dorm is about 749 here while for a mixed dorm is around 500 INR. It is situated around 200 m from Zostel Bir and is right behind the Deer Institute. There are some Homestays, hotels, etc. to stay here too which you can find on Booking.com. If you can spend some extra bucks then Colonel’s Resort is actually a good place to stay in Bir Billing. There are numerous places to eat in Bir Billing in a varied price range. So, you can easily find cheap yet delicious food here, especially in the Tibetan colony. You can check out our article on Cafes and Restaurants in Bir Billing for a detailed description of a few places to try here. Once Again very nice post by you Rachita. As you mentioned that you stayed for one month. can you please tell how much was your total expenses in terms of accommodation and food. I was actually volunteering with Zostel for a month so my stay and food was free. But, my mom had come there for a couple of days and her expenses were around 5000-6000 INR for 4 days including Paragliding. Let me know if you need more details. If one wants to start the rajgundha trekking from barot then how to reach barot from bir? Are any local buses avaoavail in bir? And what would be the fare? You can start Rajgundha hiking from Barot as well. There are local buses from Bir/Baijnath to Barot which will take around 3-4 hours and will cost approximately around 50 – 100 INR.